As you may or may not know, we are now expecting baby No. 2 in our family–due to arrive in October. Pregnancy in Korea as a foreigner is nothing new to me–in fact, as an American expat, I know more about prenatal, birthing, and postnatal health in Korea than I do in America. And, despite any bumps in the road with the first experience, I wouldn’t want to have my second child anywhere else but here, once again. One thing I really love about Korea is their care for pregnant women. For these precious ten months, women are encouraged to turn their bodies into watchful, caring, healthy vessels for these coming additions. And just as important as the mother’s health is the baby’s health. As I’ve written about before in the past, the Korean practice of “taegyo” is a common exercise. Taegyo (태교) is a very interesting concept. It basically translates to “prenatal culture,” or the education of your baby while in the womb. I did this plenty when Finn was in the womb. Reading books, trying to avoid violent or crude TV shows, etc. This go around, I’m taking my first Korean language class since the one I took when I was pregnant with Finn four years ago. This time, though, it’s an intensive course offered by the local university. Three hours every night, Monday through Friday. I love it. It’s three hours where my brain dusts its cobwebs from the corners and hangs new words and rules like colorful flags and decorative pendants. The neurocircuitry of my brain is re-wiring, and it makes my body happy (just like exercise, food and general happiness). BTW, read this cool article on what happens in your brain when you’re learning, or practicing, something new. I know all this learning and re-wiring is making baby happy too. It’s funny how we adults can get in a life rut, where we don’t challenge ourselves to be uncomfortable enough to actually learn something new. I’m just as guilty of it as you. But for these three hours a day, Monday through Friday, my toes sometimes sweat as I mumble my way through a response to my teacher about what I like to do in my free time, in Korean. And I know this toe sweat is more than a result from the current stickiness of changma (장마), or rainy season. It’s pure, unadulterated, uncomfortable learning. If you’re interested in learning some Korean, we highly recommend Talk to Me in Korean, a great online curriculum with free podcasts, videos and learning materials. 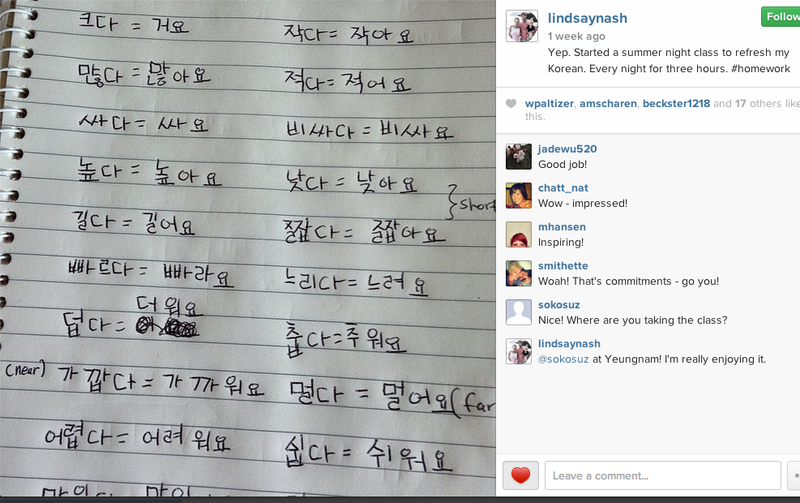 And, of course, you should definitely check your local university or international center for actual Korean classes.